Thu, Apr 18, 2019, 16:47:38 ---- The fact: 42.844.000 visitors done. T-DRILL - The manufacturer & world wide supplier of tube processing and chipless tube cutting machines have made a number of improvements and additions to their Collaring Machine model S-54. 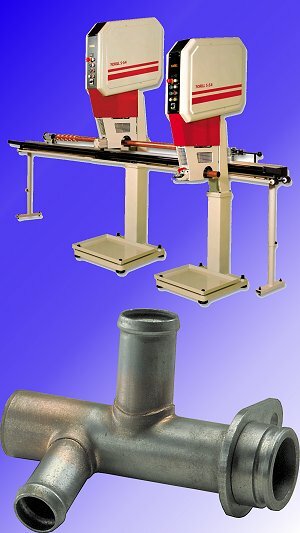 Thanks to modern technology, it is now possible to use the very same S-54 Collaring Machine model for different tube materials just by turning a switch. This has advantages especially for the job-shops that often uses different material such as copper, aluminium, mild- and stainless steel. Now optimized rotation- and feeding speeds can be easily selected for every material. No more compromises. T-DRILL Collaring method dramatically improves quality of tube joints. It also makes brazing operation easy to carry out since collar fastens the branch tube to correct position thus allowing brazing without other fixtures.